total 73 vacancies in this Alwar district recruitment of AAO and JTA Jobs. Interested candidates can submit their application form to Alwar district collector officer on or before 20-11-2017 along with all supporting documents. Candidates who are qualified Civil/Agriculture engineering diploma or degree they are eligible for Junior Assistant Technical jobs and those who are qualified B.Com Degree they are eligible for Accounts Assistant jobs of this Alwar district recruitment notification. Candidates will be selected based on merit in 10+2, Degree or Diploma and Computer knowledge for these Alwar district vacancies. More information is given below for this Accounts Assistant and Junior Technical Assistant jobs of Alwar district recruitment 2017. 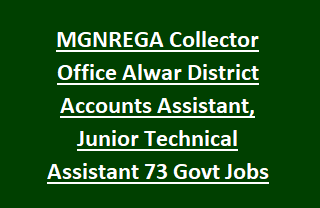 There are total 73 vacancies in this Alwar district collector office jobs recruitment 2017. Post name and vacancies are given below. Candidates must have under 35 years and above 21 years as on 01-01-2018. For Jr. Technical Asst Jobs-Civil or Agricultural Engineering diploma or degree qualification required. For both the posts computer knowledge is required and work experience in any state govt department but not mandatory. Candidates will be selected based on merit in qualifications, computer knowledge and work experience in govt departments. Total selection will be held for 100 marks. Based on these conditions only candidates will be shortlisted for documents verification. Details of merit list will be displayed on official website of Alwar district @alwar.rajathan.gov.in. Candidates may download the application form from alwar.rajasthan.gov.in website and fill all the details. Attach the required documents and submit it to the Alwar District Collector office through Speed post or registered post. Address is given in official notification. Download notification and Application form for Alwar district recruitment of Accounts Asst and Junior Technical Assistant jobs.